Morpheus has become the exclusive U.S. distributor of the AYRTON LED line. They Ayrton line of LED’s has a wide range from the real power of the WildSun 500 family of fixtures to the Versapix Club fixtures, with more in development. 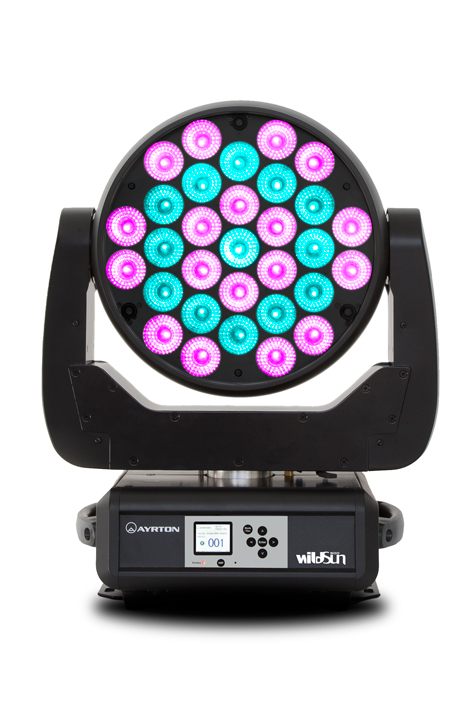 The WildSun 500C Moving-Head fixtures features 31 13watt led modules with 45mm High output optic , 4000k white, and noiseless advanced ventilation cooling system allows for 10,000 lumen output using 450 watt power consumption. The fixture is RGBW creating no color shadows. Local DMX addressing and optional parameters are accessed through a build in LCD panel, it also has built in pattern effects with speed and fade controls. There is also an information screen giving you an hour counter, temperature and software version. The WildSun 500 family includes the WildSun 500S which uses 31 15watt LED’s and is cooled using three heat sinks equipped with heat-transfer fluids. The RGBW colors are not using primary colors but rather color chosen by designers to achieve more saturated hues, and a 6700k white. This fixture has an overall output o 11,000 lumens while consuming just 500watts. The WildSun500KD is a moving head fixture variable white from 3000k-7000k. It is equipped with a linear zoom of 11degree to 45 degrees. The 500K3 is calibrated a 3200k with a 15,000 lumen output and the same zoom, only using 450watts of power. The K7 is calibrated at 6700k with an 18,000 lumen output and 500 watt consumption. 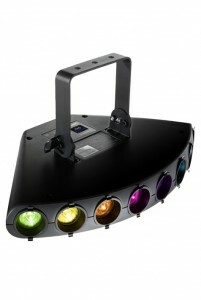 This line of fixtures is powerful with a low power consumption, great for events such as Car Shows to Concerts. The WildSun 200 S moving head is an expansion of the 500 family. The S stand for Stage in this case. Designed for the entertainment industry the WildSun 200S provides options for 4.29 billion color, and a 4:1 zoom 8-32 degrees. Using the 45mm optic the 15watt LEDs delivers an output of 4200 lumens with only a 230watt power consumption. Pre-programmed effects are available as well as being DMX/RDM compliant. The ColorSun 200 has 12 LED RGBW modules delivering maximum of 3500 lumens at a power consumption of 200 watts. The 4:1 zoom of 8-32 degrees and individual control of the 12 LEDs allows for a flexible controllable fixture. Employing the same noiseless cooling system the fixture can be used in live events and not be disturbing. VersaPix100 is a modular LED fixture allowing the creation of a variety of effects. It features 8 15watt RGBW with 45mm optics allowing for a 8degree beam. Optional filters can create horizontal or vertical beams. Individual fixtures can be combines to create fixtures in the shape of discs, spheres or cylinders. Each module can be individually controlled allowing for incredible versatility. Your imagination is the limit.